Now even your keys can be distinctively accessorized! Snap a beautiful Original Dot into the mixed-metal Firenze setting for an even more enhanced look. 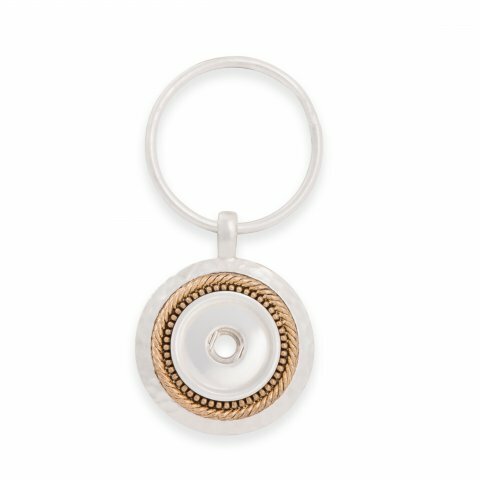 How fun to have a key chain that can sport your favorite dot! For me, a Keychain is a place where I can show off my latest Story Dot. Of course, I have a difficult choosing between the Starfish, the Semi-colon, the several beautiful crosses, and the musical dots. But the Firenze Keychain, with it's gold and silver metallics, looks great with them all. This keychain will be a favorite!! New driver? Teacher gift? Favorite babysitter? Carry your keys in style. All Dots look great in this mixed metals combination. What a fun, stylish keychain to carry for yourself or makes for a great gift! Personalize it with a letter Dot, a birthstone Dot, a school color Dot, or sports Dot. I bought this keychain and personalized it with a birthstone Dot for a Christmas stocking stuffer. What a quick and easy gift!